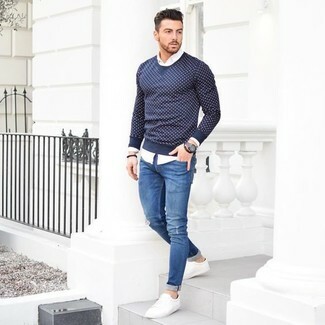 We all seek comfort when it comes to dressing up, and this combination of a navy polka dot crew-neck sweater and blue ripped skinny jeans is a good illustration of that. Spruce up this getup with white low top sneakers. 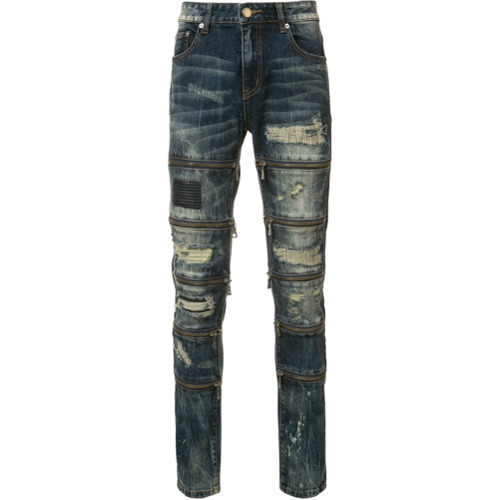 If you prefer practicality dressing when it comes to fashion, you'll love this easy pairing of a black leather biker jacket and blue ripped skinny jeans. Up the cool of your outfit by completing it with white leather low top sneakers. 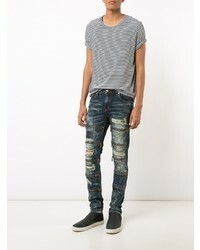 If you're a fan of practicality dressing when it comes to your personal style, you'll love this on-trend combo of a grey wool blazer and God's Masterful Children zipped ripped skinny jeans from farfetch.com. Add brown leather brogues to your ensemble for an instant style upgrade. 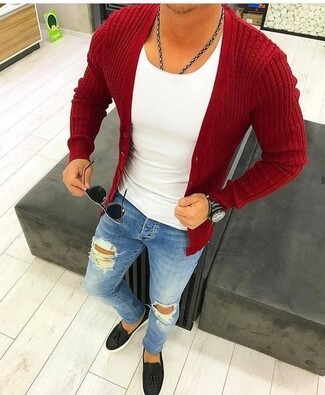 If you prefer practicality dressing when it comes to fashion, you'll love this stylish pairing of a red cardigan and God's Masterful Children zipped ripped skinny jeans. You could perhaps get a little creative when it comes to footwear and spruce up your ensemble with black leather tassel loafers. 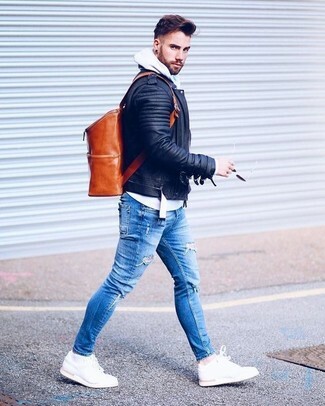 If you prefer relaxed dressing when it comes to fashion, you'll love this on-trend pairing of a navy denim jacket and God's Masterful Children zipped ripped skinny jeans. Up the cool of your look by rounding it off with burgundy low top sneakers. If you're all about comfort dressing when it comes to fashion, you'll love this on-trend pairing of a blue linen blazer and God's Masterful Children zipped ripped skinny jeans. 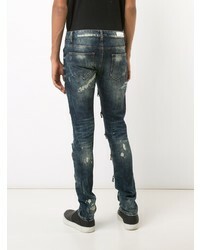 Throw in a pair of brown leather oxford shoes for a masculine aesthetic. 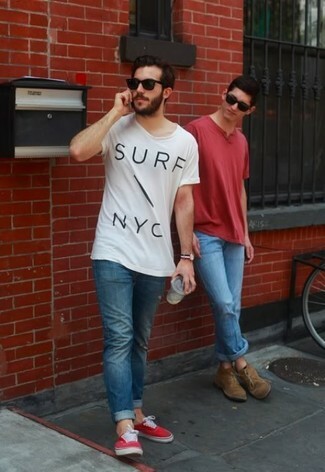 We all outfit for comfort when it comes to dressing up, and this combination of a white and black print crew-neck t-shirt and God's Masterful Children zipped ripped skinny jeans is a practical illustration of that. Spruce up this ensemble with red and white low top sneakers. 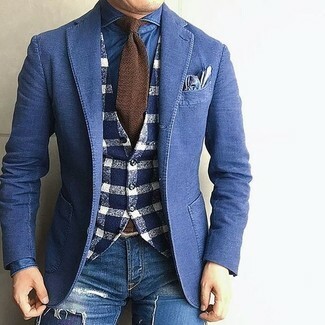 We all seek comfort when it comes to dressing up, and this combination of a blue denim blazer and God's Masterful Children zipped ripped skinny jeans is an amazing example of that. 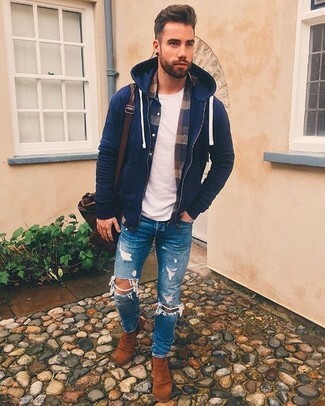 If you prefer functionality dressing when it comes to your personal style, you'll love this simple pairing of a navy hoodie and God's Masterful Children zipped ripped skinny jeans. To add more class to your outfit, complement with tobacco suede chelsea boots.